The 16th IFAC World Congress 2005 in Prague was co-organized by the Department of Control Theory. The congress is held every three years and is considered the flagship event of the IFAC Federation. 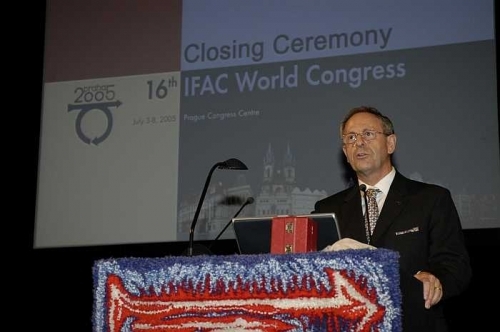 The 16th IFAC World Congress took place in the Prague Congress Center between July 3rd and July 8th, 2005. With an attendance of almost two and half thousand participants from 63 countries, this was definitely the largest and most successful event in automatic control ever. Despite its size, the Congress ran smoothly thanks to the organizing team, lead by the Congress General Chair M. Sebek. Out of the over three thousand, two hundred submitted papers, almost two and half thousand were selected for presentation. The Congress successfully completed the three-year presidential term of V. Kucera. More information about the congress IFAC 2005.